From churns to tank wagons, on small lines and main lines. Unfortunately, Wild Swan published a sample draft with unresolved aspects and errors instead of the finished item. I shall be attaching the text here as it should have been published to set the record straight. - Historical: overview of general practices; race traffic; troop specials; hunt specials; theatrical specials. - A historical overview, mainly LNER/ER, LMR. - Historical: Working of short trains; through vans; and the modelling options. - Historical: steam era milk traffic on the GWR, WR, LMS, LMR, LNER and ER. - Historical: an account of pilot engines around the country in LMS, LNER, GWR, SR and BR days. - Covering station, yard and other duties. This has now been added to under Prototype and Traffic. - Historical overview of the traffic and workings. - LMS, LMR, LNER, former GCR, GWR, WR, BR. 45609 Gilbert and Ellice Islands passes a coal train with a wide variety of wagon types and grades of coal. 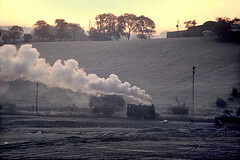 - Example photos on LNER ex-GCR, ER, LMS and LMR. RCH. - Model examples based on kits from ABS and Slaters.